Though based on a 5-door Impreza, the 2018 Subaru Crosstrek is very much its own model, blurring the lines between hatchback and SUV thanks to its ample ground clearance, rugged looks and outdoor-oriented features. 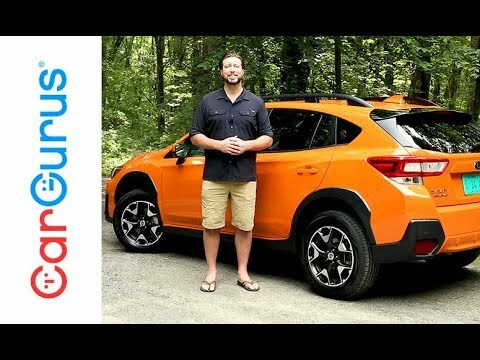 The Crosstrek isn't as athletic as the Volkswagen Alltrack, but its reputation for practicality, reliability and high resale value make this Subie a standout. Pros and cons from a pregnant women. It is a great family vehicle. I am currently pregnant and the main reason we drive this vehicle is for that reason. It is tall enough to make it easy for me to get in and out of, the suspension is great and the ride is a smooth one, and the heated seats which I only use for short periods of time really do help. This vehicle is great in snow ( I lived in Colorado when I got this vehicle) and rain (Houston). When there is a lot of water on the road and you hydroplane the steering wheel is not pulled to one side as it would with some other vehicles that I have driven. It is spacious and the hatchback does come in handy when getting groceries. One negative is that it does not have ac vents in the back, (not a major issue in Colorado) however in Houston heat it is an inconvenience but the car does cool off very fast. Very tall people might have an issue with this vehicle just because of how high the seat is. (I am 5 ft and it is not a issue for me. ) If you are a person who rides really close to other cars do not get the model with the eyesight. My mother in law has an issue when driving on the feeder road in my crosstrek when someone is turning into a parking lot and brings the car to almost a complete stop as they turn because my eyesight assist will slow the car more if the car in front is too close to you. Upside is this feature can be turned off, but if you paid extra for it why would you? I do get a great discount on car insurance for having eyesight on my crosstrek. Great vehicle with lots of defensive features and tons of fun! I love the details of the stitching on the leather seats and steering wheel. It is great on gas. 35+ highway! It is fun and I have the sunshine orange paint so it is easy to see. I have the limited addition with all the defensive features like auto braking if I get too close to a vehicle or obstruction in front of me. It alerts me if I swerve a little out of my lane and lets me know when cars in front of me have moved. It has the blind spot alert on the wing mirrors which is very helpful when changing lanes. This car handles very well on the road. Because it is a crossover it sits just a little lower than a standard SUV which means it handles better and does not have that top heavy feeling that the full size SUVs have. I recently purchased my 2018 Subaru crosstrek. I read the reviews and spent many weeks researching this vehicle before I purchased it. I am beyond happy with this vehicle. The gas mileage is a lot better than I thought it would be. I decided to stick with the cloth interior with accent orange stitching. I find that with the cloth seats I enjoy the seat warmers much more than I did with my previous leather interior vehicle. I am also impressed with the Subaru eyesight. I didn't notice much from it besides the occasion beeping, however, just yesterday a car pulled out in front of me and my vehicle stopped on its own. If I didn't have the eye sight then I would have been in an accident. Subaru of America, Inc. (Subaru) is recalling certain 2018 Crosstrek vehicles. These vehicles may be equipped with an incorrect floor mat retention bracket, allowing the floor mat to move out of position and interfere with the accelerator or brake pedal operation. If the floor mat moves out of position and interferes with the accelerator or brake pedal operation, it can increase the risk of a crash. Subaru has notified owners, and dealers will inspect the floor mat retention bracket and replace it if necessary, free of charge. The recall began November 14, 2017. Owners may contact Subaru customer service at 1-800-782-2783. Subaru's number for this recall is WTR-77.